mikesglove wrote: Here a reproduction of the Gehrig cardboard display from above. I see it at flea mkts. and on ebay a lot. Are you saying an original has never surfaced or what? I'm really not sure either way. I bought one for $10-15 in 1998 or so. They were being sold on ebay as a "find". I haven't looked at it closely in years. I'm assuming what I have is a reproduction, which is fine by me. Nice to see that there was an original though. I never bought the story that this piece was a complete fabrication. Do you know of a surviving original? Clearly there are differences, but the overall theme is very similar between the original and the reproduction, so I'm guessing there must be. I don't collect much paper memorabilia and don't have any info about any surviving original ads. As you noted, the layout of the two KenWel ads are quite different. 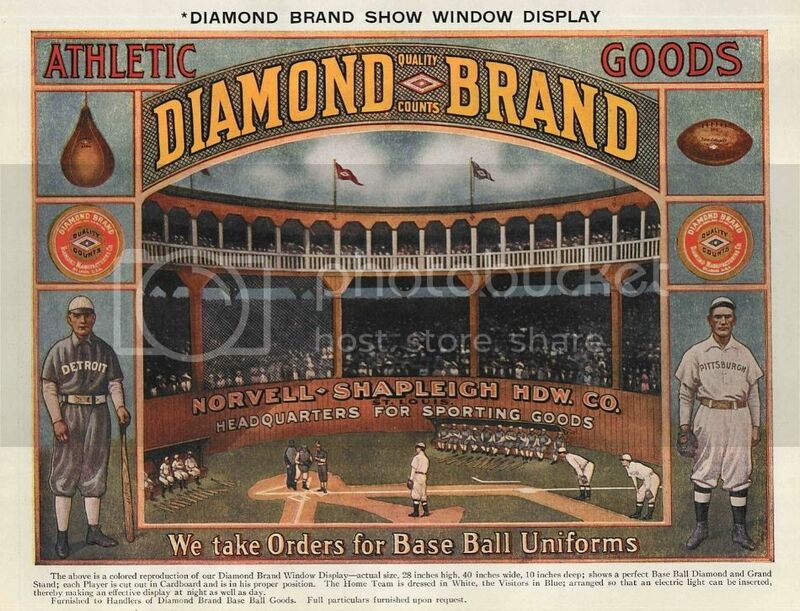 The Gehrig display in the magazine ad looks quite a bit larger than the ebay 10" X 14" die cut example. The big "Dazzy Vance" ad and those little conical ball holders are pretty cool. The reproduction looks more like a stylistic update when compared to the storefront photo, to me anyway. I would imagine there would be annual, perhaps bi-annual changes to their retail displays. Hard to tell from the grainy photograph, but it looks as though the bottom graphic is based on an end view of the Ken-Wel retail box with the action scene on top. The repro has the newer script logo from the late 20's or early 30's on top of a field in the shape of home plate, and obviously the addition of the mitt in the background. Too bad we can't see any other info on the early display, like price, etc. Going by the baseball in front of it, which is always going to be around 2 7/8 inches, I'd say the original isn't too far off from 11x14, maybe 12x16 or something like that. The Vance in the background is considerably bigger, somewhere in the 18x24 range. Whatever the case may be, it's pretty cool to see something close to the whatever-they-are displays that have been selling for years. Usually when you find something that fits into the "fantasy" realm , as this was purported to have been, it is comprised of multiple elements (usually with one being photographic) that have been combined in a new manner. The Babe Ruth Fro-Joy displays come to mind. I can't think of any completely illustrated advertising that has been produced, or reproduced, that is entirely pulled from the ether years after it would have been "new". Most companies would have a favored artist, or style, and most pieces would have a similar look. To completely imagine the Gehrig display in the 1990's with no material reference always seemed unlikely to me. I didn't even notice the conical baseball displays. Those are very cool as well. I feel like I've seen one of those at some point, probably on ebay or at auction. I'd love to see it come back around. I agree William, I would love to see a crisper view of the Gehrig ad in the window display. 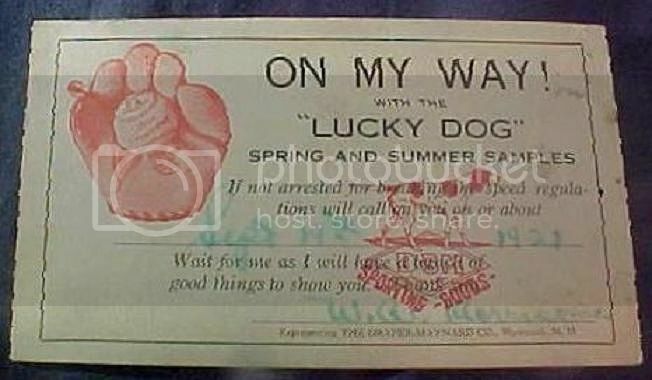 Below is a D&M salesman's business card from 1921. I imagine it's pretty rare. I followed it on ebay and it went for around $39. Circa 1910 Norvell-Shapleigh magazine ad for a killer 3D counter display 28" X 40" X 10" deep. Beautiful vintage graphics. Detroit and Pittsburgh players illustrated in the ad commemorating the 1909 World Series. vintagebrett wrote: Here's a neat ad for Thomas E. Wilson's Ray Schalk catchers mitt - sweet buckle strap for webbing. Here's a picture of this add that I just got framed. Perfect add with nor creases. here is an ad for a J.A. 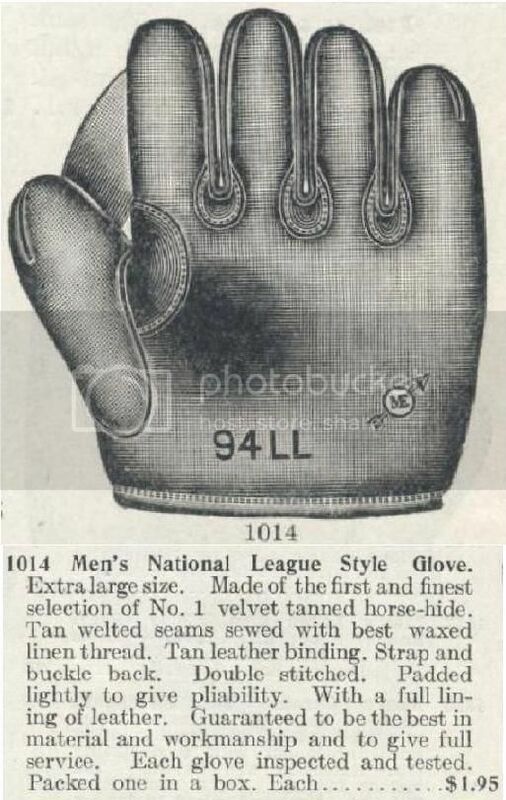 Peach glove branded and retailed by Moore & Evans circa 1911. It has the reinforced seams discussed elsewhere on the forum. 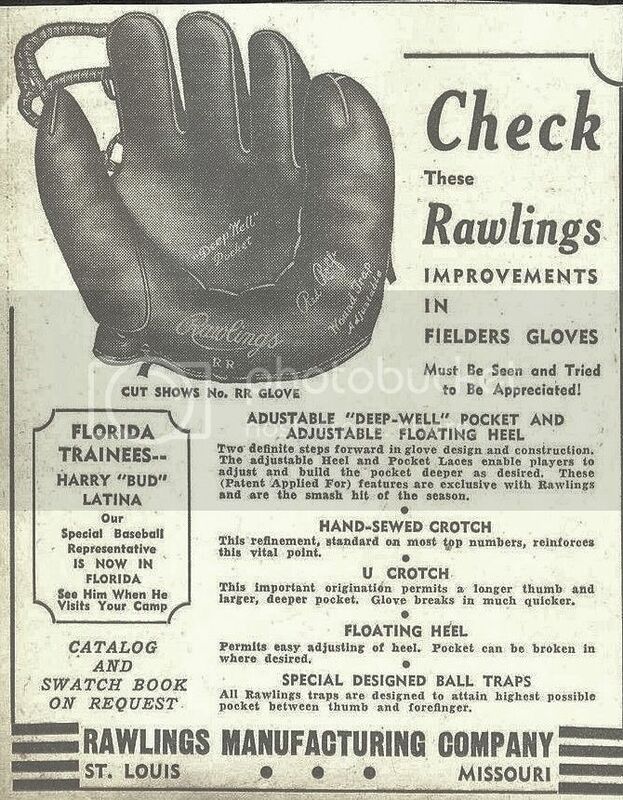 Here's a Rawlings ad circa 1942 touting their new rolled lace web model. First time I have seen an ad specifically for the Red Rolfe model. 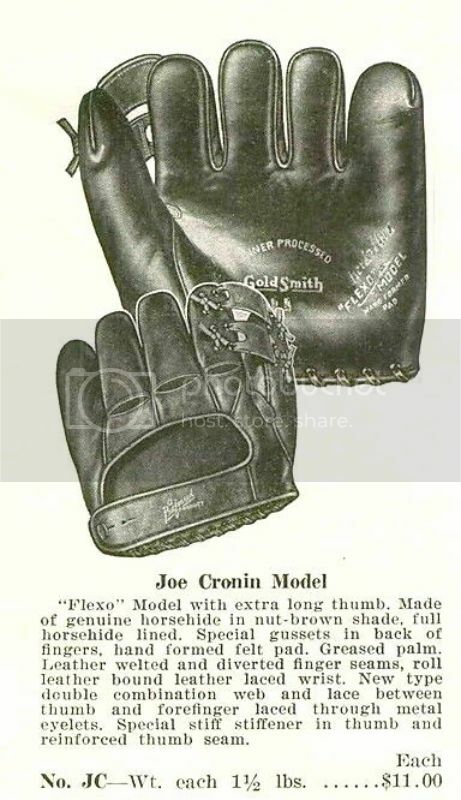 Here is a Goldsmith ad from the same era as the Rawlings glove above, circa 1942. It's a "Joe Cronin" "Flexo Model". It features a unique curve finger design that began with a series of patents in 1939 by various mfgs. The glove also has an interesting adjustable webbing. Goldsmith came out with some pretty cool designs in their heyday. This is a new die-cut advertising counter display. I'm curious if there is a Spalding "Mickey Mantle" model 42-221. That's interesting. 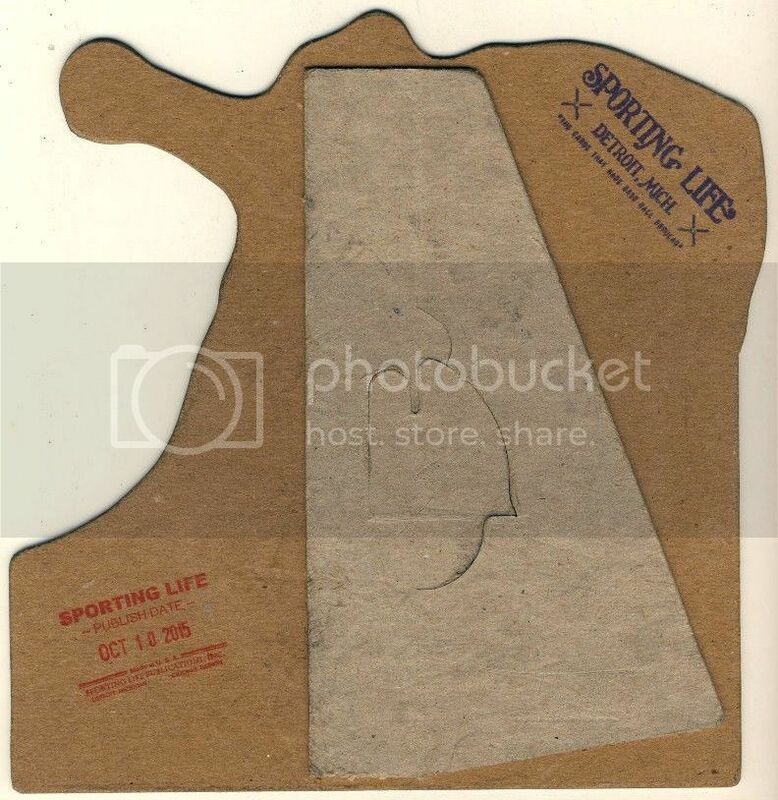 I have never seen or heard of a Spalding or Sporting Life Mantle before. 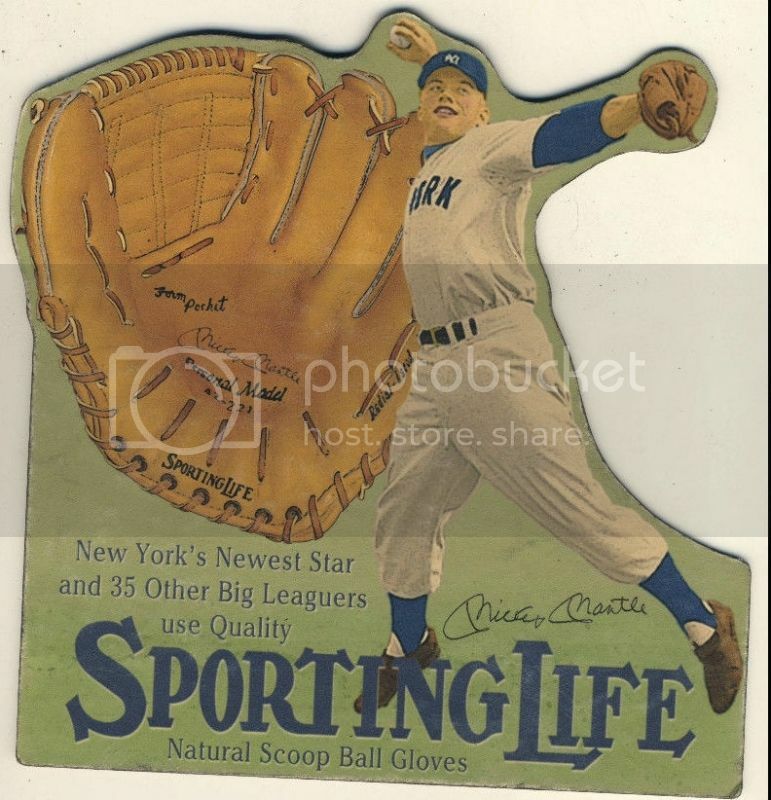 The weird thing is that is refers to New York's Newest Star and shows a young Mantle but that signature is not the 50's Mantle signature nor is it a 50's style glove. It's the later style signature and glove. I forgot off hand the year Rawlings switched over to that signature but it wasn't that early. 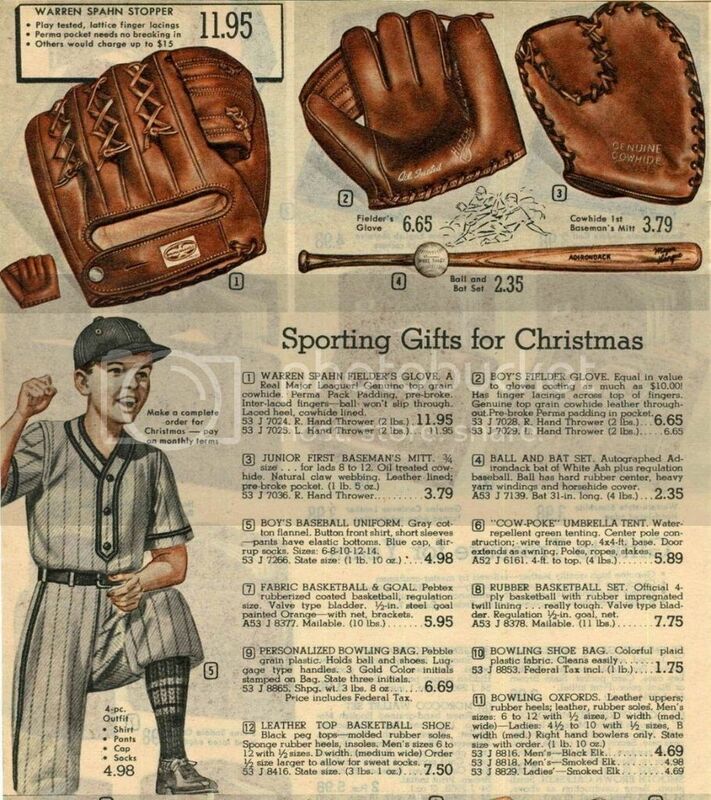 Just curious why they would use a 50's Mantle picture with a 60's style glove and 60's style signature. Great find Mike. Jim, you are right about the mixture of eras. Here is the back of the display. It's described as an art card on ebay. Looks to be a combination of various historical images. The listing states the display is "made for a very exclusive cross section of the hobby “underground”, who have lost some interest in the main stream, overproduced products that have no sense of craftsmanship and wallow in a sea of mediocrity, never to hold their value and relevance in the future". 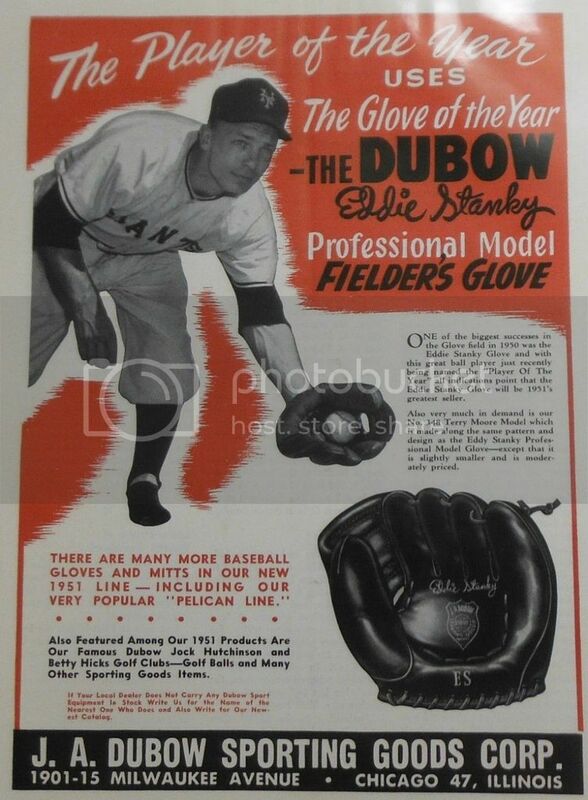 A 1951 magazine ad for the Dubow "Eddie Stanky" model ES. It was Dubow's top glove. A few years ago, Brett posted an interesting 1947 contract between Dubow and Stanky outlining use of his name, payment and royalties on sales. A couple of mid 1920's ads from Ken Wel. 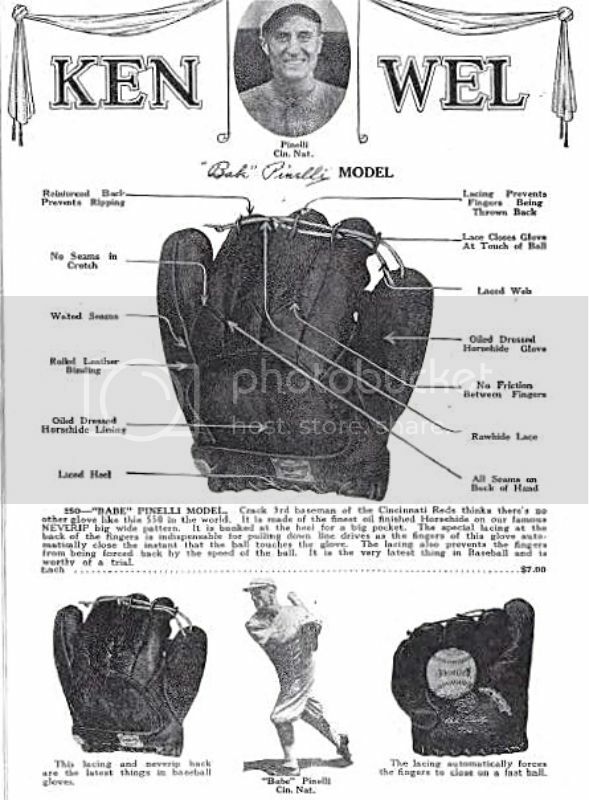 Both feature early version of the innovative laced back glove that eventually was linked to the ad campaign featuring Dazzy Vance. 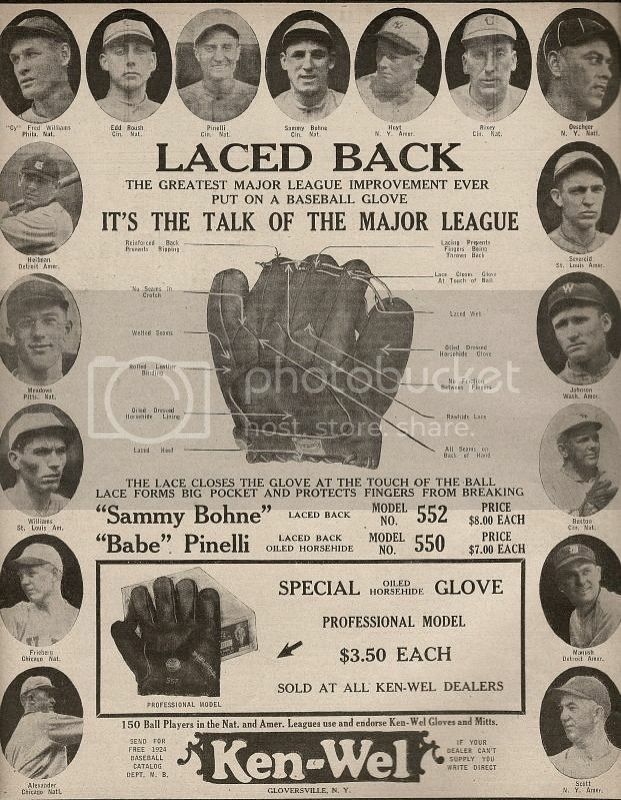 These two ads feature Sammy Bohne and Babe Pinelli.